The concordat is actually signed by Rafael Trujillo's brother, Hector, who had been temporarily installed as president for constitutional reasons. However, during this interlude, Rafael Trujillo had himself appointed Commander-in-Chief of the Armed Forces and even retained his office in the "National Palace", the main seat of government, (pictured below) where the leading officials continued to report directly to him. Trujillo's concordat has recently been challenged by the Jesus is Sanctity and Eternal Life Ministry (which has also protested against any move to allow gay marriages). On 11 June 2006 the Jesus Ministry filed an unconstitutionality recourse in the Supreme Court of Justice. They charged that the concordat violated the constitutional guarantee of "freedom of conscience and religion" (Article 8.8). ♦ They protested that Article 1 of the concordat "made the Catholic Apostolic and Roman Church the official religion of the Dominican State, which constitutes discrimination against the other churches." ♦ They also claimed that Article 2 granted a presumed privilege to the Apostolic Nuncio [Vatican "ambassador"] to be the dean of the diplomatic corps". ♦ In addition they objected that the juridical personality granted ipso facto to any religious institution or association was created for the Catholic Church, while others must conform with the legal requirements established in the country. Further criticism of the concordat has come from a women's rights group, Colectiva Mujer y Salud, which in 2013 asked the UN child rights committee to have the Vatican make public its correspondence with the Dominican criminal justice authorities concerning priests accused of child abuse. The group noted that "In the past 10 years there are reports of 6 cases of sexual abuse perpetrated against at least 19 minors at the hands of seven officials of the Catholic Church". The Holy See and the Dominican Republic, desirous of promoting fruitful cooperation for the better good of the religious and civil life of the Dominican Nation, have decided to draw up a Concordat establishing the rules that shall govern reciprocal relations between the High Contracting Parties, in accordance with the Law of God and the Dominican Republic’s Catholic tradition. and his Excellency the President of the Dominican Republic has appointed as his plenipotentiary Dr Rafael Leonidas Trujillo Molina. The Holy Roman Catholic and Apostolic Religion is the Religion of the Dominican Republic, and shall enjoy the rights and prerogatives due to it under Divine and Canon Law. 1. 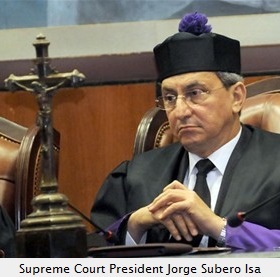 The Dominican Republic recognises the international legal personality of the Holy See and the Vatican City State. 2. So as to maintain traditional friendly relations between the Holy See and the Dominican Republic, an Ambassador for the Dominican Republic shall be accredited to the Holy See, and an Apostolic Nuncio in Ciudad Trujillo. The latter shall be the dean of the Diplomatic Corps in accordance with common law and tradition. 1. The Dominican Republic recognises that the Catholic Church is a perfect society, and guarantees that the Catholic Church shall freely and fully exercise its spiritual power and jurisdiction, and shall be able to freely and publicly organise acts of worship. 2. In particular the Holy See shall be able to adopt and publish any provision relative to the Church in the Dominican Republic without impediment, and shall communicate with Prelates, clergy and the faithful in the Dominican Republican; and Prelates, clergy and the faithful shall be able to communicate with the Holy See. Ordinaries and other Ecclesiastical Authorities shall enjoy the same rights with regard to their clergy and faithful. 1. The Dominican Republic shall recognise the legal personality of all religious institutions and associations established under Canon Law in the Dominican Republic on the entry into force of this Concordat; in particular the legal personality of Dioceses, the Prelature Nullius and related institutions, Religious Congregations, Societies promoting communal life, and lay accredited Institutions promoting Christian perfection, whether established by pontifical or diocesan right, as well as to their provinces and houses. The competent Ecclesiastical Authorities shall submit to the relevant department of the Dominican Government a list of the afore-mentioned religious institutions and associations within two months of the ratification of this Concordat. 2. Similar bodies established or approved in the Dominican Republic by the competent Ecclesiastical Authorities shall enjoy official recognition provided that the act establishing them or approving their establishment is officially communicated in writing to the competent State Authorities. 1. For the appointment of an Archbishop, resident Bishop or his coadjutor with the right of succession, the Holy See shall communicate the name of the candidate to the Dominican Government with a view to establishing whether there are any general political objections to the appointment. If the government does not respond within thirty days of the afore-mentioned notification, it shall be deemed that there is no objection. These procedures shall be conducted in strict secrecy. 2. When appointing the Archbishop and Bishops, the Holy Father shall consider appropriate priests that are citizens of the Dominican Republic. However, the Holy Father may, if he deems it necessary and appropriate for the greater religious good of the country, appoint priests that are not Dominican Nationals, on the grounds of a shortage of Dominican priests. 1. The territory of the Dominican Republic shall be divided into the following ecclesiastical areas: the Metropolitan Archdiocese of Santo Domingo; the Diocese of Santiago de los Caballeros; the Diocese of La Vega; the Prelature Nullius of San Juan de la Maguana. 2. The Holy See shall seek the agreement of the Dominican Government prior to establishing new Dioceses or Prelatures nullius, or to effecting other changes to dioceses as may be deemed necessary, except in the case of minor alterations required for the good of souls. 1. The Dominican Government undertakes to build the Cathedral, Church of the Prelature, the residences of the Bishops or Prelate Nullius, and the offices of the Curia as may be required in current existing Dioceses and Prelature, as well as in Dioceses established in the future. 2. Furthermore, the Government shall provide a monthly subsidy for administrative costs and for poor churches to the Archdiocese of Santo Domingo, and to each Diocese or Prelature Nullius such as currently exist or that may be established in the future. The Archbishop of Santo Domingo shall have the title of Primate of the Indies, in accordance with the Bull of Pius VII Divinis Praeceptis of 28th of September 1816. The title, rights and privileges of the Metropolitan Church of Santo Domingo as a Minor Basilica, granted by Benedict XV in Breve Inter Americae of 14th of June 1920, are hereby confirmed. 1. The establishment, alteration or suppression of parishes or other ecclesiastical offices or posts, the appointment of the Vicar General, Curia officials, parish priests or other officials of the Church shall be determined by the competent Ecclesiastical Authorities in accordance with the provisions of Canon Law. Furthermore, the relevant authorities shall inform the Government as soon as possible of the appointment of the Vicar General, parish priests, and, in cases where a parish is vacant, of the priest temporarily charged with that parish. In making appointments, the Authorities shall, where possible, give precedence to appropriate priests who are Dominican nationals. 2. Any Government objection to the conduct of an ecclesiastical official shall be considered and decided on by the competent Ecclesiastical Authorities. 1. The Ecclesiastical Authorities may avail themselves of the services and cooperation of foreign clergy or lay staff, and appoint foreign priests to ecclesiastical posts when it is deemed appropriate for the good of the Country, the Diocese or the Prelature. 2. Foreign priests or clergy invited to the Country by the Church for the purposes of their ministry or apostolic duties shall be exempt from any and all immigration taxes. 3. General or regional Superiors of Holy Orders or Congregations who reside outside the Dominican Republic, even if they are foreign nationals, shall have the right to visit their orders or their houses in the Dominican Republic, either personally or by delegation. 1. Ecclesiastics shall enjoy the special protection of the State in the exercise of their ministry. 2. Ecclesiastics may not be cross-examined by judges or interrogated by other authorities on matters of which they have acquired cognizance as part of their holy ministry, and which therefore fall under the secret of their spiritual duties. 3. Clergy and holy orders shall not be obliged to assume public office if these duties are deemed incompatible with their ordained status by Canon Law. In order to exercise other duties or public office, they shall require the Nihil obstat of their own Ordinary, and the Ordinary of the place where the duties are to be carried out. If the Nihil obstat is revoked, they shall not continue to exercise these duties. Clergy, philosophy and theology seminarians, and holy orders (whether professed or novices) shall be exempt from military service, except when there is a general mobilization. In the case of a general mobilization, priests shall perform military service by providing religious assistance; other clergy or holy orders shall be assigned to the health services and the Red Cross. The following shall be exempt from military service even in the case of a general mobilization: Bishops, priests who charged with the care of souls, such as parish priests and their assistants, and priests required in the service of diocesan and prelature Curias, or Seminaries. If a criminal charge is brought against an ecclesiastic or member of a religious order, the state jurisdiction charged with the matter shall duly inform the competent Ordinary, and forward to him the results of the investigation, and, should the eventuality arise, the ruling or sentence at Court of first instance, appeal, review or cassation. Should an ecclesiastic or member of a religious order be placed under arrest, he shall be treated with the respect due to his ordained status. If a prison sentence is passed on an ecclesiastic or member of a religious order, that sentence shall, as far as possible, be served in facilities separate to those for lay persons, unless the sentenced person has been reduced to lay status by the competent Ordinary. Ecclesiastics or members of religious orders who have been forbidden to use the ecclesiastical and religious habit by order of the competent Ecclesiastical Authority, which should be officially communicated to the Authorities of the State, are forbidden from doing so; such use or the unlawful use of religious habit by other persons shall be subject to the same penalties as the unlawful use of military uniform. The abuse of ecclesiastical jurisdiction or unlawful exercise of ecclesiastical functions shall be subject to similar penalties. 1. The Dominican Republic grants full civil recognition to marriages contracted under Canon Law. 2. In accordance with the inherent nature of Catholic matrimony it is understood that by virtue of contracting Catholic marriage, spouses renounce the possibility of divorce, which shall not be applicable to these Canon marriages. 1. Cases for the annulment of Canon matrimony, the dispensation of unconsummated marriages, and procedures relative to Pauline Privilege shall be the exclusive competence of the relevant ecclesiastical Tribunals. The Holy See agrees that cases for separation shall be dealt with by civil Courts. 2. Definitive decisions or rulings of ecclesiastical organs and Tribunals shall be submitted to the Supreme Tribunal of the Apostolic Signatura for review; the Supreme Tribunal shall then forward the rulings together with its own decrees by diplomatic channels to the competent Dominican Court, which shall implement them and enter them into the civil registry, and append them to the marriage certificate in question. The Dominican State shall guarantee religious assistance to the army, navy and air force; to this end the State shall cooperate with the Holy See to establish and organize a corps of military chaplains. These chaplains shall be assigned the rank of officer, and shall be subject to the Metropolitan Archbishop in matters pertaining to their ministry, and subject to the discipline of the armed forces in matters pertaining to their military service. 2) Feast Days in the Dominican Republic, namely: the feast of Our Lady of Altagracia (21st of January); the feast of Our Lady of Mercedes (24th of September). The State shall adopt legislative provisions to allow the faithful to perform their religious obligations on these feast days. National and local lay authorities shall observe these feast days as days of rest. 1. The Dominican Government shall provide the religious assistance necessary to national establishments such as schools, hospitals, old people’s homes, children’s homes, prisons, etc. To this end, if an establishment does not have its own chaplain, the State shall allow free access to the local parish priest, or to the priest so charged by the competent religious Ordinary, so that he may provide spiritual succour to the establishment. 2. The Catholic Religion shall be taught, and its precepts applied, in orphanages, official educational establishments, and correctional establishments for minors. 3. Where possible, the Dominican Government shall charge religious orders with the management of hospitals, old people’s homes, orphanages and other national charitable institutions. The Holy See shall encourage this project. 1. The Church shall be free to establish Seminaries or any other type of ecclesiastical training institution; these shall not be subject to the supervision of the State. 2. Awards, degrees or school certificates conferred by these institutions shall have the same legal validity as awards, degrees or certificates conferred by the State, and shall be deemed equivalent. To this end, the competent Ecclesiastical Authority shall forward to the relevant State Authority the texts used in the aforementioned educational establishments for the teaching of subjects other than theology or philosophy. 3. Degrees and qualifications awarded at Pontifical Universities or Higher Educational Establishment shall receive the same official recognition in the Dominican Republic as degrees awarded by the State. 1. The Dominican State shall guarantee the Catholic Church full freedom to establish and run all and any type of school, which shall remain under the authority of the Church. Given the social utility of such schools for the Nation, the State shall grant official protection to these schools, and shall provide appropriate subsidies. Religious education in the aforementioned schools shall be freely organised and imparted by the Ecclesiastical Authorities. 2. School certificates granted by primary educational establishments under the authority of the Church shall have the same validity as those granted by equivalent State educational establishments. 3. Exams or tests for the awarding of official certificates of secondary education to pupils of secondary educational establishments under the authority of the Church shall be held on the premises of these establishments at the request of the Ecclesiastical Authorities; the exams or tests shall be organised by special committees made up, at least in part, of State teaching staff. 1. Education provided by the State in public schools shall be guided by the moral and doctrinal principles of Catholicism. 2. All public primary and secondary schools shall teach Catholic religion and morality to pupils and students, unless their parents, or those substituting them, have requested an exemption in writing; this instruction shall follow programmes drawn up by common agreement with the competent Ecclesiastical Authority. 3. For the aforementioned instruction only texts previously approved by the Ecclesiastical Authority shall be employed; the State shall appoint primary and secondary education teachers who have been issued a certificate of suitability by the competent Ordinary. The withdrawal of this certificate shall have the immediate effect of disqualifying him or her from teaching religion. In appointing primary and secondary education teachers the State shall take into account recommendations of the Ecclesiastical Authority; for secondary schools, if there is a sufficient number of priests or clergy in holy orders, and if they have been proposed by the local Ordinary, they shall be given precedence over lay teaching staff by the State. 4. The parish priest or his delegate shall have access to primary schools to provide regular Catechism instruction. 5. Local Ordinaries may visit schools personally, or delegate such visits, in order to ascertain how religious and moral education is being imparted. The State shall ensure that information services and institutions under its aegis, and radio and television programmes in particular, assign sufficient priority to the presentation and defence of religious truth; it shall do so through priests and clergy in holy orders appointed in agreement with the competent Ordinary. 1. The Dominican State recognises that the religious institutions and associations mentioned in Article IV have full capacity for the acquisition, ownership and management of all categories of property. 2. The normal and extraordinary management of property belonging to the aforementioned religious institutions and associations, as well as the supervision and inspection of their management shall be the responsibility of the relevant Church authorities. 3. The Dominican Republic recognises and guarantees the Church’s ownership of movable and immovable property acknowledged as belonging to the Church under Law nº 117 of the 20th of April 1931, clarified by Law nº 390 of the 16th of September 1943, as well as Church ownership of property legitimately acquired after this date, including properties declared national monuments. The Dominican Republic declares that all places of worship or other premises built by the State since 1930 are the property of the Church, as are other buildings built by the State in the future. 4. The Church may receive any type of donation or gift intended for achieving its aims; it may organise special collections inside or outside places of worship or other premises owned by the Church. 1. Holy buildings, Seminaries and other buildings for the training of clergy, buildings owned by the Church used for public purposes, the residences of Bishops or other clergy, shall, if they are the property of the Church, be exempt from all taxes or levies. It is expressly agreed that all property acquired by the Church as a donation from a living person, or through inheritance from the will of a deceased person, shall be exempt from capital gains or inheritance tax, provided that the properties thereby received are employed for worship or public purposes, either at the behest of the donor or testator, or if the competent Ecclesiastical Authority so decides. 2. Ecclesiastical property not covered by the foregoing paragraph shall not be taxable or subject to special levies. 3. On the grounds of their spiritual ministry ecclesiastics shall not be subject to any tax or levy. 4. Local Ordinaries and parish rectors shall have the free use of postal and telegraph services for their official correspondence within the country. 5. Edicts and notices relative to the sacred ministry which are affixed to the doors of places of worship shall be exempt from any tax or levy. The State guarantees the freedom of organisation of Catholic associations of a religious, social or charitable nature, and in particular that of Catholic Action associations under the authority of local Ordinaries. On Sundays, feast days of precept and National holidays, a prayer for the prosperity of the Republic and its President shall be recited or sung at the end of the main liturgy in all Cathedrals, Prelatura Churches and parishes in the Dominican Republic. All other matters relative to ecclesiastical persons or property not dealt with in the preceding articles shall be settled under Canon Law currently in force. Should any doubt or difficulty arise in the future with regard to the interpretation of this Concordat, or should the need arise to settle matters relative to ecclesiastical persons or property which also affect the interests of the State, the Holy See and the Dominican Government shall proceed by common accord with a view to finding an amicable settlement to any dispute. 1. This Concordat, the Spanish and Italian language versions of which are equally valid, shall enter into force upon the exchange of ratification instruments, which shall be verified within two months of the signature of the Concordat. 2. The entry into force of this Concordat shall imply that other Laws, Decrees, Orders or Regulations that oppose the provisions of the Concordat shall be repealed. The Dominican Republic shall adopt the internal provisions necessary for the implementation of this Concordat within a period of six months. In faith whereof, the Plenipotentiaries sign this Concordat. Two copies have been drawn up. Vatican City, 16th of June 1954. I, Máximo Antonio Ureña Hernández, Head of the Administrative Department of the State Secretariat for Foreign and Religious Affairs, certify that the foregoing copy is true and in accordance with the original CONCORDAT between the HOLY SEE and the DOMINICAN REPUBLIC filed in the archives of this State Secretariat. Ciudad Trujillo, 1st of July 1954. In signing the Concordat today concluded between the Holy See and the Dominican Republic the Plenipotentiaries signing have by common accord made the following declarations, which shall be an integral part of the Concordat. b) three hundred gold pesos a month to every other Diocese or Prelature Nullius. When a foreign religious order or congregation is to be invited to the Dominican Republic, the competent Ecclesiastical Authority shall inform the Government. Within three days of the celebration of the marriage the Parish Priest shall forward a true copy of the marriage certificate to the competent State Civil Registry official so that it may be transcribed into the civil registry. This transcription shall be carried out within two days of receipt of the certificate; within three days of the transcription taking place the State Civil Registry Official shall duly notify the Parish Priest of the date of transcription. Parish Priests who, without serious grounds, fail to forward a copy of the marriage certificate within the stipulated time period shall be deemed guilty of disobedience; Civil Registry Officials who fail to transcribe the certificate in due time shall be subject to the sanctions provided for in the internal rules of the service. B) It is understood that the civil validity of a marriage duly transcribed into the civil register shall commence on the date of the celebration of the Canon marriage. However, when the transcription of a marriage is requested five days after its celebration, this shall take place without prejudice to the legitimately acquired rights of third parties. The transcription into the civil registry of the marriage shall not be prevented by the death of one or both spouses. 1. The Holy See confers the title of Pontifical Institute to the Seminary of Saint Thomas Aquinas in Ciudad Trujillo. Furthermore the Government undertakes to carry out extensions to the buildings donated to the Seminary, as deemed necessary by common agreement of the Parties; the Government undertakes to defray the costs of the aforementioned institution by means of a monthly contribution of fifteen gold pesos for each Dominican seminarian pursuing his studies in the Seminary. 2. In order to increase the prestige of national clergy, the State shall grant the Ecclesiastical Authority four scholarships for Dominican seminarians to pursue their studies in the Pontifical Athenea in Rome. 1) No permit or other formality shall be required for the establishment of a school under the aegis of the Ecclesiastical Authority. 2) State supervision of schools subject to the Ecclesiastical Authority shall be restricted to health and safety standards; it shall also include, to a limited extent, the development of curricula in the establishments mentioned in paragraph 2 of this article; State supervision shall always be carried out in such a way as to take account of the special nature of the aforementioned schools, and with the agreement of the relevant Ecclesiastical Authority. 1. The State shall not declare other ecclesiastical property national monuments without the agreement of the competent Religious Authority. 2. It shall be understood that an ecclesiastical property declared a national monument shall be inalienable, and that the Ecclesiastical Authority, owner of the property, shall not carry out alterations or modifications without the agreement of the competent civil Authority. v. Domino, salvam fac Rempublicam et Presidem ejus. r. Et exaudi nos in die qua invocaverimus te. r. Et rege eos et extolle illos usque in aeternum. I, Máximo Antonio Ureña Hernández, Head of the Administrative Department of the State Secretariat for Foreign and Religious Affairs, certify that the foregoing copy is true and in accordance with the original FINAL PROTOCOL to the CONCORDAT between the HOLY SEE and the DOMINICAN REPUBLIC filed in the archives of this State Secretariat. DONE in the Sessions Chamber of the Palace of the Senate, Ciudad Trujillo, District of Santo Domingo, Capital of the Dominican Republic, on the seventh day of the month of July of the year one thousand nine hundred and fifty-four, 111th year of Dominican Independence, 91st year of the Restoration, and 25th year of the Trujillo era. DONE in the Sessions Chamber of the Chamber of Deputies, Ciudad Trujillo, District of Santo Domingo, Capital of the Dominican Republic, on the seventh day of the month of July of the year one thousand nine hundred and fifty-four, 111th year of Dominican Independence, 91st year of the Restoration, and 25th year of the Trujillo era. I ADOPT this Resolution, and order that it be published in the Official Gazette so that it may be known and enacted. DONE in Ciudad Trujillo, District of Santo Domingo, Capital of the Dominican Republic, on the seventh day of the month of July of the year one thousand nine hundred and fifty-four, 111th year of Dominican Independence, 91st year of the Restoration, and 25th year of the Trujillo era. * Celebrant: Lord, bless the Republic and its President. Celebrant: Bless your people, oh Lord; and bless your inheritance. Congregation: Rule over them, and praise them forever and ever. Celebrant: Lord, hear my prayer. Congregation: And may my cries reach you. in fulfilling their duty, through Christ Our Lord.